He’s an artist. He’s famous. He’s dead. While most artists spend their lives battling this unfortunate cliche, the late Ray Johnson embraced it, even planned it this way. Johnson’s mysterious death in 1995 was the masterpiece that has earned him the recognition he couldn't bear during his lifetime. Four years after his suicide, a major exhibition of his work opened at New York’s Whitney Museum of American Art, the country’s standard bearer of contemporary art. Who was Ray Johnson, why did he kill himself, and what has happened to his artistic reputation since his death? The last days of Johnson’s life reflected a pattern in his career: he often melded art and life to produce a singular, startling statement that even his closest friends didn’t anticipate. This agile 67-year-old man, who had jokingly announced his own demise many times as part of his art, jumped from a bridge on Friday the 13th in January 1995 and drowned. Early in January, he told several people he was in the process of creating his “greatest work” to date. A week later, he was gone. He was last seen alive by two teenage girls in Sag Harbor, N.Y., as he was backstroking into a cove. The next day, his corpse was pulled, fully clothed, from the water. “He looked peaceful” says Joe Ialacchi, chief of the Sag Harbor police. Johnson’s carefully-crafted exit set a “Paul Is Dead” mystery in motion that permeated the art press. Journalists interviewed his far-flung correspondents, sifting through old letters for clues to explain this complex man and his enigmatic endgame, while art dealers researched auction prices, scrambling to represent his estate. In life, when a critic referred to him as “New York’s most famous unknown artist,” Johnson gladly recycled the comment into his work. Now his premeditated death has prompted a much-deserved rescue mission from artistic obscurity. Max Anderson, director of the Whitney Museum, says he’s “pleased to bring Johnson’s work to a broad audience” in the exhibition entitled Correspondences. But it wasn’t always possible. In the early ’60s, Johnson turned his back on convention and gave his art away to anyone who interested him, via something he called the New York Correspondence School. He set up the tongue-in-cheek institution, infuriating dealers and delighting the friends and acquaintances who received the works. By sending his pieces through the mail, he created an international network of collectors and shattered boundaries in the art world, meanwhile remaining its best-kept secret. “Johnson’s mail-away art can’t be bought or sold but only received,” the late critic David Bourdon once remarked. The hermit-like Johnson worked quietly on his “school” and his collages from his home in a western Long Island town. 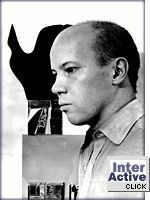 The Detroit native attended experimental Black Mountain College in North Carolina in the 1940s, then befriended a who’s who of art stars-to-be in New York City. Then, on the same day in 1968 that his good friend Andy Warhol was shot, Johnson was mugged at knifepoint in downtown Manhattan. In reaction, he relocated to conservative Locust Valley, Long Island, reducing most socializing to phone and mail. Rare appearances at New York events became legendary, always including a touch of the absurd. He’d arrive for a meeting swinging a long rope as a prop or visit a wealthy collector carrying dozens of collages in a cardboard box. While Johnson’s treatments of Elvis and James Dean are seen by scholars as the first examples of what later became known as Pop art, it remains to be seen if this insider can now capture the imagination of a larger public. “He’d begin with one set of rules and then change them in the middle of the game,” explains William S. Wilson, a major Johnson collector. This “strategy” often put exhibitions in peril before they began. His cultivated knack for subverting norms made life difficult for those who wanted to show his work, and kept him out of the public eye. With his oddly well-planned death, Johnson seems to have removed the final obstruction to a mass appreciation of his unique genius. At long last, Ray Johnson is ready for his close-up. The works in the Whitney exhibit of Ray Johnson's work, Correspondences, display his adeptness at creating a dance of meaning among visual elements, ideas, people and events. 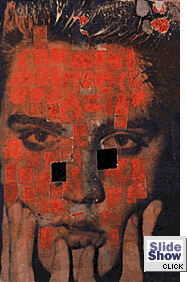 Included in the exhibit are selections from the five decades of work that earned him a secret reputation in the well-heeled art world: collages silhouette portraits, mailings from his New York Correspondence School, early paintings and objects, and documentation of performances he called “nothings,” a nose-thumbing response to 1960s Happenings. The day before the Whitney opening, none other than Monica Lewinsky walked through the gallery, presumably enjoying the references to popular and cultural icons as diverse as David Bowie, Greta Garbo and Shirley Temple. Had Johnson lived, Lewinsky surely would have been added to the fray. His collages incorporate texts and images from newspapers, magazines, comic strips and items received in the mail, making for a visual jambalaya, chopped up and reassembled for contemplation. The Whitney show runs through March 21. It will be presented at the Wexner Center for the Arts at Ohio State University, where it was organized, from Jan. 29 through April 16, 2000.